Oscar Health announces the hiring of Sid Sankaran two months after AIG replaced him in the CFO role. Is this a big step down, or an exciting new opportunity? Sid Sankaran, who in December was replaced as CFO of insurance giant American International Group, has signed on to run finance at the much smaller Oscar Health, the company announced on Wednesday. Sankaran is slated to start his new job on March 1. AIG was ranked 55th on the most recent Fortune 500 list, with 2017 revenue of $49.5 billion. Oscar is a privately held, six-year-old provider of health insurance and related technology-based services for individuals and small groups. Sankaran, 42, joined AIG in 2016 and helped the company fend off an effort to break it up by activist investor Carl Icahn. The company abruptly announced on Dec. 5 that chief actuary Mark Lyons would immediately take the finance reins. 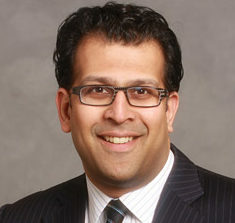 Sankaran had previously served for five years as AIG’s chief risk officer. At the time, CEO Brian Duperreault said the company was “not satisfied” with its adjusted return on equity of 8% heading into 2019. Sankaran’s total compensation with AIG in 2017 was $11.9 million, including a $1 million salary, a $1.6 million bonus, and $9.3 in stock awards. The total pay was more than double the $4.9 million he earned for 2016. “Sid embodies an unmatched breadth and depth of experience in subjects critical to any company, such as capital and strategy, as well as those particularly important at Oscar, such as actuarial and risk,” said Oscar CEO Mario Schlosser in the company’s announcement of Sankaran’s hiring. At Oscar, Sankaran replaces Brian West, who left the company last September after three years to join Refinitiv, a financial data firm owned by Thomson Reuters and the Blackstone Group. West had previously been with Nielsen Holdings, first as CFO and then as chief operating officer, for 10 years. Lyons, the new CFO at AIG, joined the company in 2018 from Arch Capital Group, where he had been CFO and treasurer.